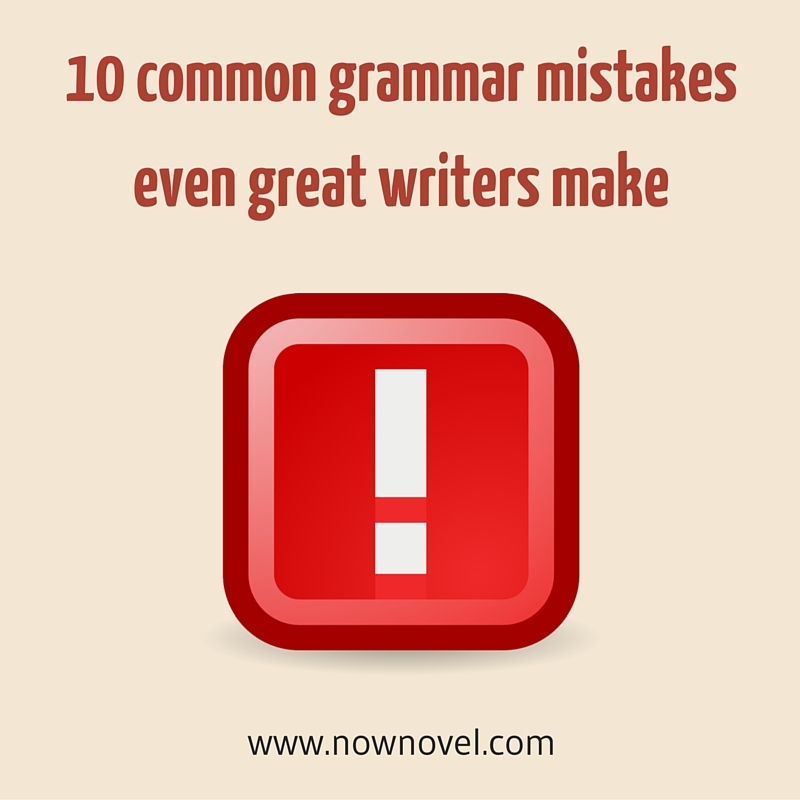 There are far more than 10 common grammar mistakes that even the greats make. Mistakes in the drafting stage aren’t catastrophic. After all, you’ll edit your novel at a later point in time. A clean manuscript appeals to agents and editors, though, so read on for 10 common grammar mistakes you can learn to identify and avoid. Even though some say you should break all writing rules, you need to master the rules of writing first. It’s one thing to make a quirky grammatical choice and another to make an error out of ignorance. This is an easy mistake to make, but it’s also easily corrected. “Who” is used for the subject of a sentence and “whom” for the object. Here’s the easy part. If you can substitute “he”, “she”, or another noun, “who” should be used. If instead you would use “her” or “him”, “whom” should be used.Who is the best teacher? She is. To whom should I give the best teacher award? To Her. This is a common error but even more easily corrected than “who” and “whom”. Use “who” for people and “that” for things.Adam is the one who asked about the engagement ring. This is the engagement ring that he meant. This one is a bit more confusing. Use “that” when it is essential to the sentence. Use “which” when you are qualifying information that is not necessarily essential.I don’t vacation at hotels that don’t allow pets. This hotel, which has a nice beach view, is not a good option for me because it doesn’t allow pets. This is a common grammar mistake because the past tense of “lie” is “lay”. In present tense, “lie” is something the subject of the sentence does, and it does not require an object. “Lay” in the present tense is a transitive verb, however, and this is used to describe an action done to someone or something.I lie around all day. I lay the tray on the counter carefully.NB: Remember the past tense of the verb ‘to lie’ is the same word as the present tense transitive verb for the same: Yesterday, I lay around all day. The past tense of the transitive verb lay, however, is ‘laid’: That afternoon, I laid the tray on the counter carefully. The clause that begins a sentence has to have the same subject as the sentence itself. Walking down the street, the trees were battered by last night’s storm tells us that the trees themselves were walking down the street. Corrected, it might read like this: Walking down the street, we noticed that the trees were battered by last night’s storm. This is another common but easily-fixed grammar error. “Fewer” refers to things that are quantifiable (can be counted); “less” is for things that cannot be counted.I’d like less milk in my coffee and fewer than three spoonfuls of sugar. These two words are not interchangeable. “Like” is frequently used improperly in place of “as though”. “Like” can only be followed by a noun or pronoun. “As though” only precedes a verbal clause, because ‘as though’ creates the expectation of an action-based event:She looks like my mother. I cried as though I had lost my best friend. Many people make common grammar mistakes by assuming that a passive sentence is any sentence that uses a form of the verb “to be.” In fact, passive voice is simply a sentence in which the object appears as the subject of the sentence.The house was given to me by my Great Aunt is still passive voice (‘the house’ is the object of the sentence and I, the speaker, am the subject. There is no ‘to be’). Many people believe passive voice is always ‘weak’ or ‘bad’. In fact, passive voice may effectively convey a certain rhythm or mood. Sometimes the object of a sentence is the most important part. Sometimes the passive construction helps to convey a character’s passivity. What kind of basic grammar errors drive you mad? Join Now Novel to get helpful feedback on your writing in progress and catch and correct your errors.